But a bar chart doesn’t work for all data. Data visualization tools must be flexible so you can tell different stories. And finding the optimal visual representation of your data requires experimentation. Sometimes by exploring different perspectives, you can uncover trends and outliers that were previously hidden. To explore visualizations effectively, interactivity is essential. Interactive graphics enable you to grasp and analyze complex data intuitively. Visual analysis involves getting data, representing it in one way, observing results, and asking follow-up questions. Those additional questions prompt you to drill down, filter, bring in new data, or create another view. Without interactivity, your questions go unanswered. With the right interactivity, data visualization can not only answer questions but act as an extension of your thought processes. Power BI has outstanding visualization capabilities that support just this kind of interactive visual thinking and analysis. Let’s look at just a few of them. 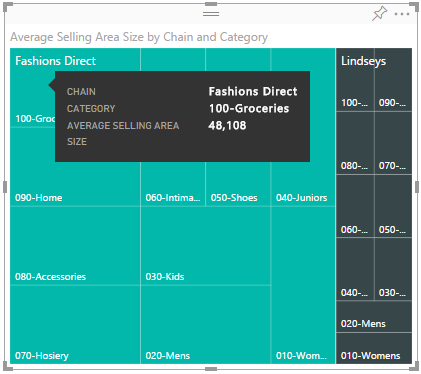 Let’s use the Power BI Retail Analysis sample to create and modify a visualization. To open the report in Presentation View, under Reports, click Retail Analysis Sample. To open the report in Editing View, click Edit Report. 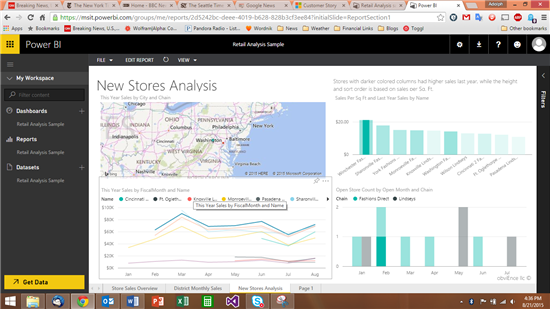 Power BI opens the report in editable form. To add a new page to the existing report, at the bottom of the canvas, click the plus icon. 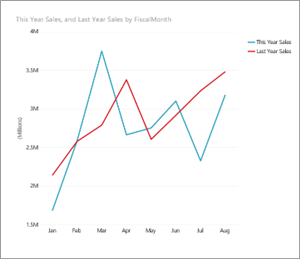 You want to add a visualization that compares last year’s sales to this year’s. From the Sales table, select This Year Sales and Last Year Sales. 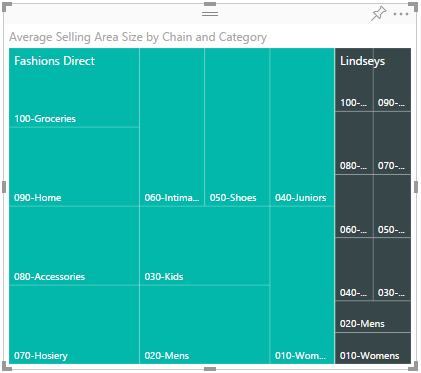 Power BI creates a column chart. You wonder what sales look like by month instead of by year. From the Time table, drag Fiscal Month to the Axis area. Power BI displays a bar chart of sales by month. You want to see the same sales information represented as a line chart rather than a bar chart. 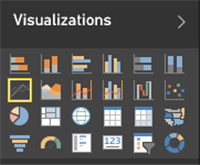 On the Visualizations pane, select the line chart icon. 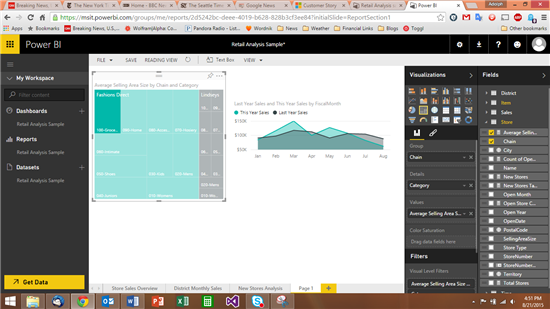 Power BI changes the visualization to a line chart. Want to see the contribution of any single store to overall sales? Simple. 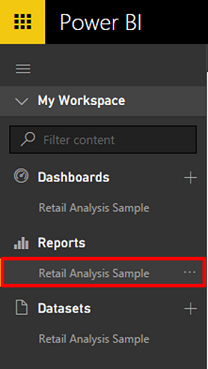 Click on the data of an individual store. 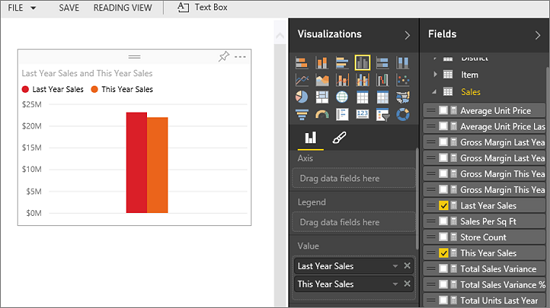 Watch how Power BI automatically adjusts the display to reveal the impact of your selections. Suppose you want to look at sales amount by store location. Creating a map visualization is simple in Power BI. From the Store table, select Territory. Power BI recognizes that Territory is a location and creates a map visualization. 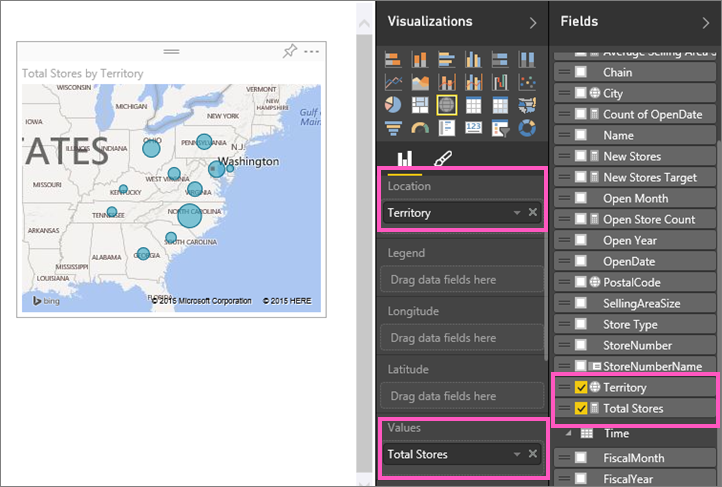 From the Store table, drag Total Stores into the Values area. Instead of total stores, you want to see sales performance by chain name. 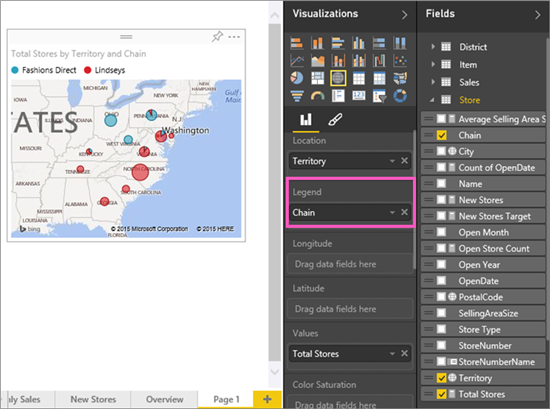 To see the data by store name, from the Store table, drag Chain into the Legend area. 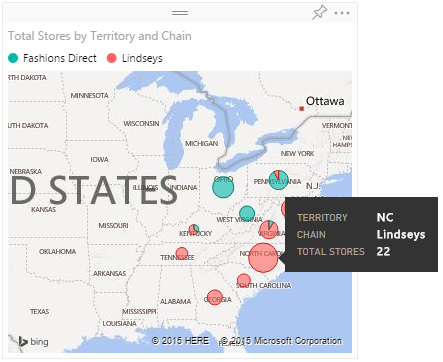 Power BI displays the map showing Total Stores by Territory and Chain name. 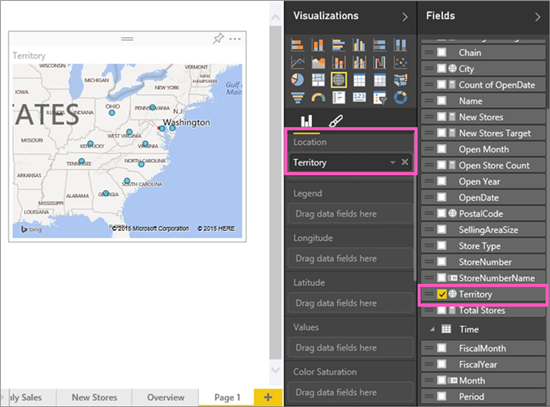 You want to see data for an individual territory displayed on the map. Easy. Hover your mouse pointer over any territory circle. Power BI displays the store details. Suppose you want to see the contribution of one territory in the context of other data. On the Report page, click any territory circle. Power BI adjusts the display to highlight that territory’s data in the other visuals. Treemaps are a cool way to display hierarchical data as a set of nested rectangles. Each level of the hierarchy is represented by a colored rectangle that contains other rectangles. The space inside each rectangle relates to the quantity being measured. 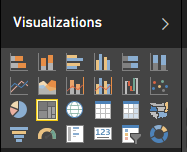 From the Visualizations panel, select the Treemap icon. From the Store table, select Average Selling Area Size. From the Store table, select Chain. The treemap shows average selling area size of the chain stores. You now want to further divide the treemap to see how the average selling area is allocated to different merchandise categories. In the Item table, click Category. To view data for individual merchandise categories, hover the mouse pointer over any rectangle. 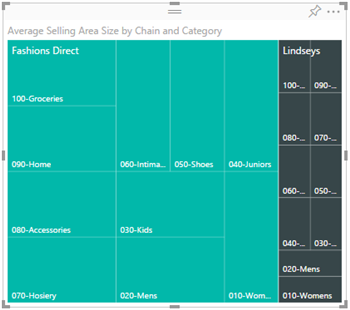 Want to find out the sales figures of any single category displayed in the treemap? In the Treemap, click the rectangle for the category. 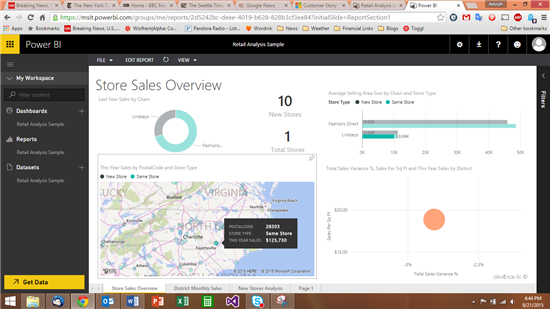 Observe how Power BI changes the sales visual to reflect the data for the selected category. Want to pin your visualization to your dashboard? Simply click the Pin icon. 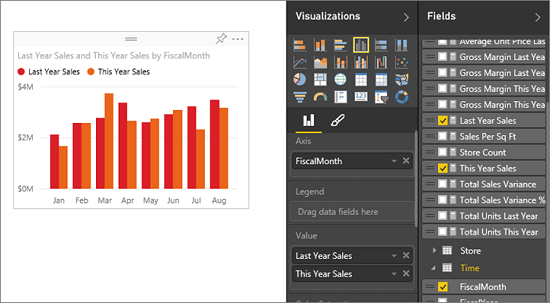 Because Power BI enables anyone to answer their own questions without programming knowledge or specialized skills, analyzing data becomes faster, easier, and more insightful. 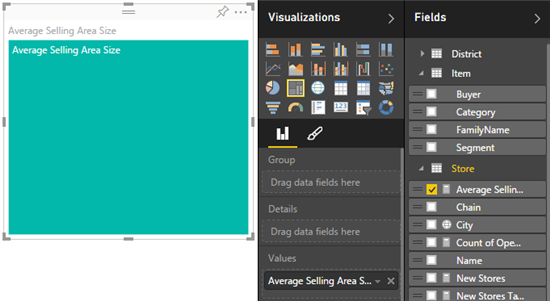 Try creating your own killer data visualizations in Power BI. Sign up today for free.